Carlos Juarez, designer and founder of Vintage Artisan. Meet Carlos Juarez, founder and designer of Vintage Artisan. I first noticed Vintage Artisan when I saw pictures of the Huaraches on Twitter. It was actually perfect timing as I was recently discussing the lack of options for men when it came to summer styling. Especially when it came to shoes. In an informal poll amongst my close female friends, results showed that flip flops are not a favorite thing to see on men. I’m definitely not a fan but I realize that when the weather gets warm, us ladies can’t expect to see men in socks and boots all the time. Enter Vintage Artisan huaraches. It was love at first sight! Not only am I already a huge fan of woven leather but Carlos’s redesign of this traditional shoe appealed to T&P’s aesthetic. The styling range of these shoes fit the bill for a classy man’s spring /summer wardrobe. 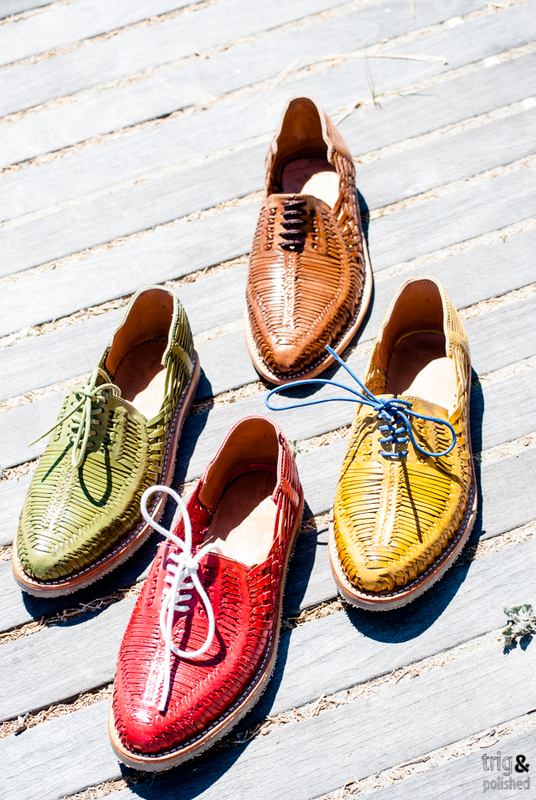 From the beach to a sumer wedding, these gorgeous hand-crafted shoes keep men looking trig and polished. When I discovered that Vintage Artisan was based in San Francisco, I knew that I had to meet Carlos and find out more. It takes 3 hours for a Master Huarachero to craft each VA shoe. When did you start Vintage Artisan? I started Vintage Artisan in 2010-11. The thing about VA is that I came up with the name way before discovering the aesthetic. So I was on a hunt for creating a standard since 2010 all the way to my launch early this year. What gave you the idea to start designing these shoes? Back then I had an entirely different idea on who I wanted to market to. I was very set on launching a brand catering to messenger men or just people on bikes. Re-inventing the traditional Huarache hit me like a ton of bricks. It was a very cool shoe, not cool as in awesome but bearable. So I designed a shoe like the traditional Huarache but better. How long have you been designing these shoes? I designed these shoes back in 2007 or 08 during my early stages of becoming a fashion designer. Luckily I discovered my sketch early this year and put it right into production. 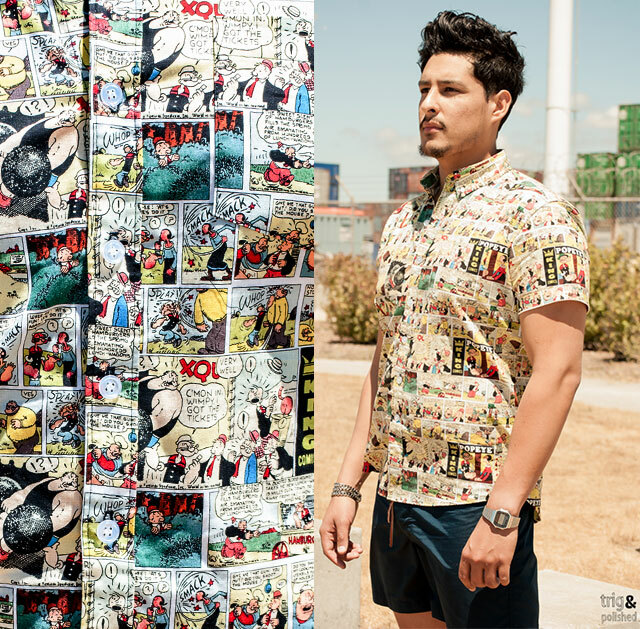 Carlos is wearing VA Comic Print Shirt in Popeye. 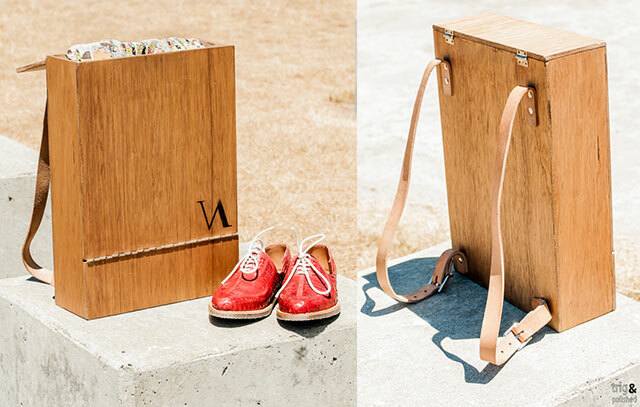 Besides the shoes, the box and the shirts shown on your website, are there any other products that you are working on or have made in the past? Well I have made a lot of products in the past, but were all made for learning purposes. I have new color Huaraches that recently came out. (Pictured below). I’m also dropping more summer goods such as swim trucks, tees, and more shirts! I’m not sure, I have certain elements that I take with me when exploring new looks. For example, I have to have contrasting shoes … red, gold, green I need something that pops. I don’t like to match from head to toe. If I have to wear a really clean suit and a crisp white shirt I need to have my Red Nike Cortez on. The second is a nice subtle ring and my watch. How would you define SF style? SF style is great. You will find someone wearing the most mediocre outfit to the most expressive piece of article and the great thing is that they will both be respected. I think SF is learning real quick how important fashion is, maybe because all the start ups are bringing over all the dapper British Blokes? No but really, I think we are in a very exciting transitional phase and people are just having fun dressing up or dressing down and I’m speaking on behalf of menswear. Vintage Artisan’s huaraches in the latest colors. What is the best way for interested people to reach you? I am pretty easy to reach! Follow me on my Twitter account @ByCarlosRJuarez . Instagram @Vintage_Artisan and of course my website at www.VintageArtisan.com . Also I will be doing weekly interviews with all my followers. What will happen is that we will pick an “Artist of the Week” and interview them, then later post it on our blog. So stay tuned. Carlos with girlfriend Yanira Romero, editor of Vintage Artisan and according to a very grateful Carlos, ” she does a lot behind the scenes for VA”. Gorgeous hard-working couple! 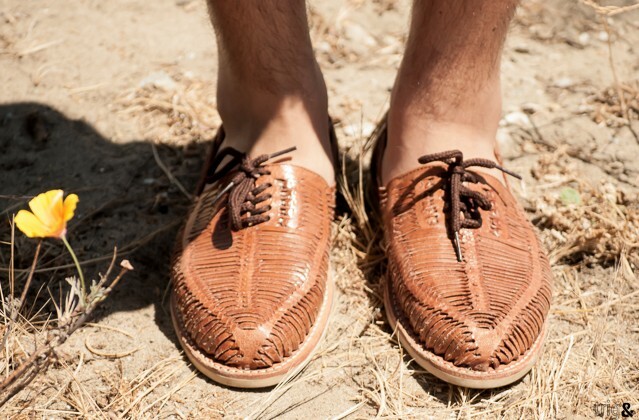 Carlos’s vision for his Huaraches are to become the alternative to boat shoes (aka Top-Siders). I can definitely see that happening. Boat shoes are a nice classic look but they definitely have a preppy feel to them and not a lot of men I know feel comfortable in that look. 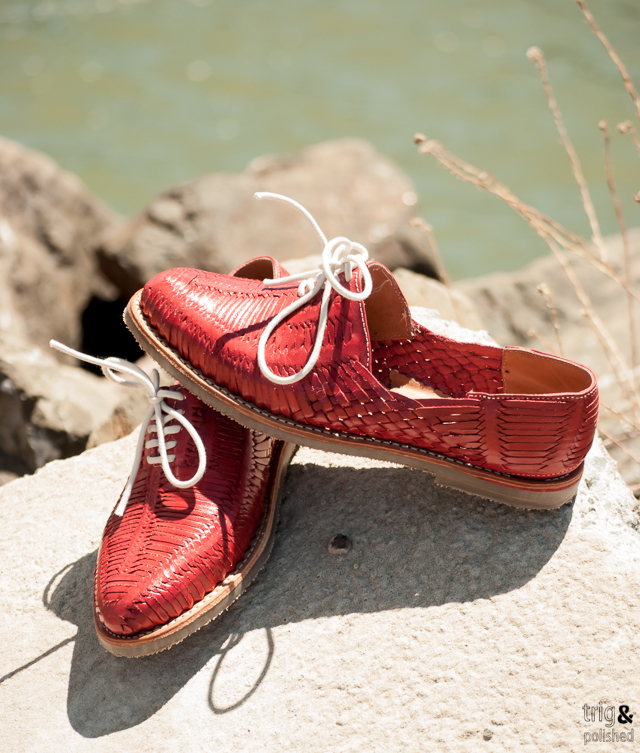 The Vintage Artisan shoes have a look that conforms more to the dress shoe crowd, yet it’s casual enough to pair with shorts AND take out on a sailboat. T&P is definitely down with the Huaraches. Check out VA’s summer lookbook here. For more Vintage Artisan looks, keep an eye out for Carlos and his collaboration with UK Designer, Tom Lipop. Trunk shows are scheduled this year in Milan, Berlin, Florence, Paris, New York and London. Check out VA’s Twitter and the VA blog for updates. It’s so great to see Vintage Artisan taking off and getting noticed. Bravo to Carlos for introducing this gorgeous option to men everywhere. Go get them before it’s too late!